Saturday morning started slightly cloudy, but it was supposed to be a sunny day. Good. I did not want to have memories of my last few days on dry land being wet. Although the weather forecast for tomorrow is not good. I think “Get used to it” comes to mind! We still don’t have our official “uniform”. Apart from the orange hat that is. I have a suspicious feeling that this uniform is going to somewhat emulate the reaction to Susan’s new village shop tabards in the Archers. If you don’t listen to the Archers you don’t know what you are missing!! There was a rumour going around yesterday that they had turned up some time ago, but Clipper had sent them back as they were inferior quality and wouldn’t last the first leg let alone a whole circumnavigation. Not sure how true that is – but we may be waving goodbye to Tower Bridge as the only team not to be in corporate apparel. I think that will be OK though – it will make us stand out from the crowd. Paul had arrived into London last night – the pressures of looking after Travel Stop meant he couldn’t come any earlier! Or was it that he wanted a quick preview week of what it was going to be like without me at home? We had a Clipper Party to go to, where everyone was going to be there. We had had a crew party at a Brazilian Restaurant the night before, but I hadn’t actually got there. I was still having to do fresh food orders and write out galley rules, so when I finished at 10.30pm I really couldn’t face going out at that time. Not ideal, but I think I will be getting enough “late nights” in the next few months so didn’t wanted to start tired. Everyone had a great time – I am sure I wasn’t even missed. Our boat was open boat today, so we had to be on duty from 12 noon to 7pm to show people around. There was a constant stream of people – starting with Susan from ABTA. What a lovely surprise! After she had gone, Izzie from ABTA Lifeline arrived with Stephen and three others. It was really lovely to show people around that I knew – and Leo the Lifeline Lion had his photo taken on a winch. By the end of the day, Paul was due to arrive so I took my leave of absence. So, we went to the party at the Grand Connaught Rooms, and Paul got to meet everyone that I had ever trained with. It was like one big reunion – except that he didn’t know anyone. He did by the time we left. These people are such a lovely bunch! And Wendy had a ball – I think we have a real party animal for a skipper. Over the past couple of days everyone had been busy working on the boat, but there is always so much more to do. Izzie had helped me negotiate a fresh vegetable order with Turnips Distributing from Borough Market – our crew only get the best! I agreed to pay for a list of fruit and veg that I wanted in return for him giving me everything he hadn’t sold at the end of business on Saturday. It turned up when I had nipped off the boat – and when I looked the boxes only contained the items that I had ordered. Bit disappointed with that! After half an hour or so, I decided to phone the guy on his mobile, just to say thanks for delivering the goods. It turns out that there were three boxes on the van that were still on the van! Nice guy Charles says that he will put them in a taxi straight away. Glad I phoned and checked. Lucinda from Scenic Tours phoned to say that she was on Tower Bridge with her daughter and boyfriend, so I went to meet them and gave them a tour of the boat. Lovely to see another friendly face! And then we had a message that the uniform has arrived – oh goody! Bright orange tee shirts, and a blue fleece that looks amazingly like one Paul has, that I hate. Hopefully the weather will always be good enough not to need a fleece. At least you will see us coming in that colour. And it isn’t as bad as Susan’s tabards!! To cut a long story short, we had a Leg One Briefing at a venue fifteen minutes walk away at 3.30pm. I had a Tesco order due to be delivered between 2pm and 3pm, and at 2.15pm I needed to find the taxi with the veg in. I spied a trolley thing that would come in handy, and took it over to the road and waited. And waited. I went over the other side of the bridge, and it promptly went up and I got stuck there. I got a call from the taxi people, went back over the bridge when it went down (leaving my trolley there, as I was trying to find the taxi) found the taxi – but then someone had pinched my trolley! Couldn’t lift all the veg (I did have Jenny, the wife of a “new” round the worlder – who signed up for one leg before flying over to finish his level four training, and ended up signing up for the whole lot so his wife is having to fly home on her own!) but we couldn’t manage it all. I got another couple over to help lift it back, and then the Tesco driver phoned. What a plonker!! He was parked miles away, wouldn’t move, and was not particularly happy. He unloaded all the trays, so felt that if I shot off he would have no option but to follow. I was far enough out of earshot to hear any grumbling!! It was now 3.20pm, and I was late. We were parked over the other side of the marina so we had quite a way to go – plus there was a constant stream of people coming the other way going to the briefing. Not good! Then he said he wasn’t “allowed” to come down the ramp onto the pontoon. I smiled through gritted teeth!! After several ups and downs with all the shopping I was the only one left that wasn’t where I was supposed to be. Paul was downstairs on the boat wiring up the fans (another long story!!) so I just left it and ran. Wasn’t too late – I think they started a bit late. We then had a Team DaNang Crew Meeting with Wendy – we all have to be on the boat at 8am tomorrow morning to finish off all the little jobs and pack the rest of the food away! Australian David (there are three on this leg, could get confusing!) said he had a fortune cookie yesterday that said he wouldn’t be getting any parking tickets for the next twelve months – that’s a pretty safe bet then! Just as I was getting off Amy wanted another interview. Not sure what it is with me at the minute – I have been doing interview after interview. Probably think that I am about the nuttiest person doing this, looking like I do! I have been on ITV News, BBC, RYA and Clipper’s own media stream. Getting to be a bit of a pro! She said she would be interested in speaking to Paul tomorrow, as he is holding my fort! Not sure how that will go!! It was 7pm, and Paul had been in the Executive Lounge since 6pm. I think he probably won’t even notice I’m not there with all that free wine! The canapés that I’ve had in there every day have done for dinner most nights – they are lovely and very substantial. They seemed to have done Paul for dinner as well! The Ladies in there have been brilliant – I have used it rather a lot as the coffee is good, there are always snacks (and the odd wine!) and it is so handy. I have brought several people up there with me, and have never been told off! This was a superb hotel to have chosen to stay. We staggered back to the room (what adventurous people we have been on our last night together for a few months!) to find that the Ladies from the Lounge had left a lovely good luck note and a bottle of wine in the room. Perfect! Tomorrow will be a slightly different day I feel…………………..
And I name this boat……………..
Today was the naming ceremony for our boat. The official bit. And what a fabulous few hours it was. After I arrived at the Tower Hotel by taxi two days ago, time seems to have flown. The taxi driver chatted all the way down to London. He said he had picked up people that he really remembered – a stunt lady from the Jurrasic Park movie, and Beth Tweddle to name a couple – and said he was going to remember me in the same way. My god – what an honour! Especially as I was being taken with a Tesco Home Delivery of liquid egg! I didn’t actually mention that to him – I think he thought I just had load of luggage! As is my want, I upgraded the room to the Executive Level on arrival – after having negotiated the price of course. Free drinks all day, breakfast, snacks and canapés in the evening – all only two minutes from the race village, and therefore very accessible – will be worth it’s weight in gold. I immediately went to the boat with two of the Tesco bags, and found Hugh, Wendy and Michael covered in oil after the engine had broken. Oh dear – not a good start! I dropped off the first two bags and went back for the next lot. It all went in the fridge, along with the Tupperware full of Nanaimo bars (still think a little bit of bribery and corruption is going to help me along the way). I am not proud. Wendy gave me a handful of fans that had been installed on the boat, and then uninstalled as they were the wrong voltage. How are we going to be able to sleep in 50 degree heat?? Email off to Paul for help! The new ones will be delivered to the Clipper Office on Thursday. How would I manage without him?? Back to the hotel for canapés and drinks, before retiring and not sleeping more than two hours at a time. My mind is just not switching off. Thoughts of running out of food or toilet roll mid atlantic is keeping me awake! The next morning I had a full day of Mission Performance training. My assumption of this day was that it was going to help me mentally get around the world. The reality was a little different. It was actually for me to help everyone else mentally get around the world. Those attending from our boat was four round the worlder’s – Matt, Kat, Craig, myself and Phil who is doing leg 5. Michael was due to come, but didn’t turn up – I think the broken engine from last night might have had something to do with it. But what a team we made. I really do believe that I have been allocated the right boat. We had various scenarios to work through, and as a team we performed incredibly well. No-one thought they were in charge – everyone had time to listen to everyone else. This is getting more and more perfect. Only the physical bit of sailing to overcome then! Matt reminded me of my eldest son – 28, so around the right age, very intelligent and his bum hanging out of his trousers. I am going to be able to get along with him I feel! Kat, a Swedish lady, is very direct and seems very capable. Craig, an Australian New Zealander, is very quiet but extremely capable. And Phil is an English gentleman that seems to know how to do things but is willing to listen to others instead of insisting on doing things his way. And none of them think they are superior to the other – unlike some of the others on other boats. We left the course thinking that we had picked up some really good tips, and hopefully will be able to pass on some of the tips we had learned today to the rest of our team. We walked back to the Clipper office at St Katharine’s Dock and picked up our official “Race Crew” T shirts. I went back to the hotel and changed into my “large” only to find it was too small. What is going on here?? I went straight back and changed it for an extra large – they said that the sizes were coming up very small. Was that them trying to be kind or honest? Not sure, as the diet had not gone quite to plan in the last few months!! I went to the boat to see if I could be of any help, but everyone was in the process of departing. After having a quick chat with Valerie, it seems that I need to get a few more things on order – so back to the hotel to get the old Tesco Click & Collect in progress. Despite doing extensive research before I left, it seems the only click and collect available in St Katharine’s Dock was Tesco Direct and not Tesco Grocery. So I changed it over to a home delivery to go to the Clipper Office here. Not sure how that one is going to work? Will I ever see it?? Another Makro order went in, as well as a Tesco Direct for Tupperware. Will this ordering ever finish?? I am going to have to get better at this. So, today was our naming ceremony. At 9am we had to take our passports and yellow fever certificates to the Clipper Office. They took them from us and allocated them to a boat “grab bag”. If we have to abandon ship, there is just one grab bag to take with us with all the important stuff in rather than everyone trying to find their own in a state of emergency. Hopefully, this is just good practice rather than expecting it to happen. I met Jonathan from Colombia in the queue who I sailed with on Level Two. It is amazing how many friends from around the globe I have already made. Back to our boat, and we were in the process of moving over to the pontoon for the officialities of the day. We didn’t have our “DaNang Vietnam” uniform – it was coming from Vietnam and wasn’t going to be here until Friday. But we did have the orange hat. Oh dear!! 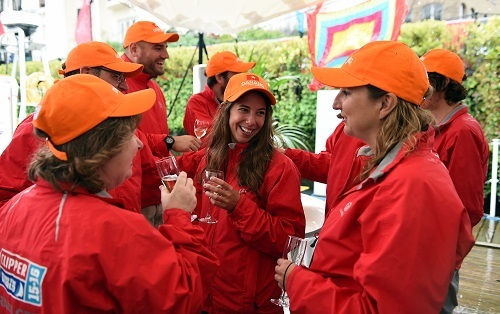 We all got off the boat, and had an introduction by the Ambassador of Vietnam to London, The Deputy Mayor of London, Sir Robin Knox Johnson and of course our own Wendo. She, in no uncertain terms, said she hadn’t come all this way to come second. Fighting talk!! The gong was banged, we were told rain was a good omen (it was chucking it down at this stage) and the champagne was sprayed all over the bow of the boat. I think we might have a very good welcome when we arrive into DaNang next February. Hope I am still hanging in there! We had a few photos taken, showed a few VIP’s around the boat, ate some lovely Vietnamese food and, of course, had a few glasses of champagne. It was Hugh’s 21st birthday today – what a party!! Emily and I then slipped back to the Tower and had afternoon tea in the Executive Lounge. We went back to the boat, and got stuck in to a few more of the jobs that needed doing. All the food that had been stored needed mapping on a map, bungee cords needed fitted over cubby holes, sail hanks needed freeing up and endless other little jobs that just keep coming and coming. Then I get a call – Tesco delivery is here. I got off the boat, just in time to see the delivery man bringing the trolly down the ramp to the boat – I think I might do this one again!! Tiredness creeps on – I think a quick glass of wine back in the Lounge together with a couple of canapés would do me for the evening. Wendy joined me for a quick one – and an hour and a half and several glasses later we have talked through tactics for a happy boat, and have put the world to rights. Let’s hope it helps me sleep tonight!! Today I packed my bags and said goodbye to Elmswell for eleven months. It still doesn’t seem real, and I won’t be crawling into my lovely comfortable bed for my compulsory eight hours sleep next week. I have had a fantastic few days – so many people have been sending cards and gifts and wishing me luck. They all probably think I will need a lot of it!! I have had a few days off work, so have sort of been getting things together for what I will need. Or have I? I haven’t a clue what I will need really. There doesn’t seem anywhere enough in that little pile in the corner of my bedroom to last nearly a year. I hate packing – and so inevitably that is why I always leave it to the last minute. There is always something more important to do. Or I make something more important to do. I had started to make my “pile” about five days ago, thinking that I would have so much time I wouldn’t have to leave it to the last minute. Ha! Wrong. There still wasn’t anything actually in the case at 1pm – the taxi was coming at 4pm. I had finished work and said goodbye to several friends and customers during the last week or so – it still didn’t feel that real. It was really strange – I didn’t feel much emotion. It just didn’t feel as if it was really going to happen. I had an absolutely fabulous party yesterday. It started out as going to be a barbeque in my back garden, but as these things do, grew to well over 100 guests at Haughley Barns – just up the road from me. I decided to make it a Clipper Farewell Charity Party – I like to have a reason for a party other than to kiss me goodbye. The venue is fantastic – one of the most beautiful venues in Suffolk. The Williams family that own the barn rent it out for weddings and other events, and let us have it for free as it was for charity. It couldn’t have been better. I did invite Sir Robin Knox Johnson, but was told he had a prior engagement. Not sure the invite actually got to him, but we had somebody much more important – my skipper Wendy! She made a huge effort to come – leaving the Race Village in St Katharines’s Dock and coming to Suffolk on the train. If she can make that effort for me, I am sure going to make every effort for her! The sun was shining, we had Pimms to greet all the guests, and a very talented Caribbean Steel Band. There were three very dodgy Russian waiters that were going round with the canapés though! Very polite, but English was most certainly not their first language. They were getting into all sorts of tangles with words with several of the guests. Jamie Lee Smith Catering provided the food and staff, and did a superb job. The Russians moved us all into the Barn to take our seats for the food, and whilst everyone was settling into their chairs they came out with roses and a guitar. They sang beautifully – serenading several of the ladies including Wendo, and singing the Scottish National Anthem to Nancy which was actually the Proclaimers song “500 miles”. They got laughs galore, and were a really good act. The only person that knew that the waiters were really West End Actors was me, and they took everyone in hook line and sinker. Great job! 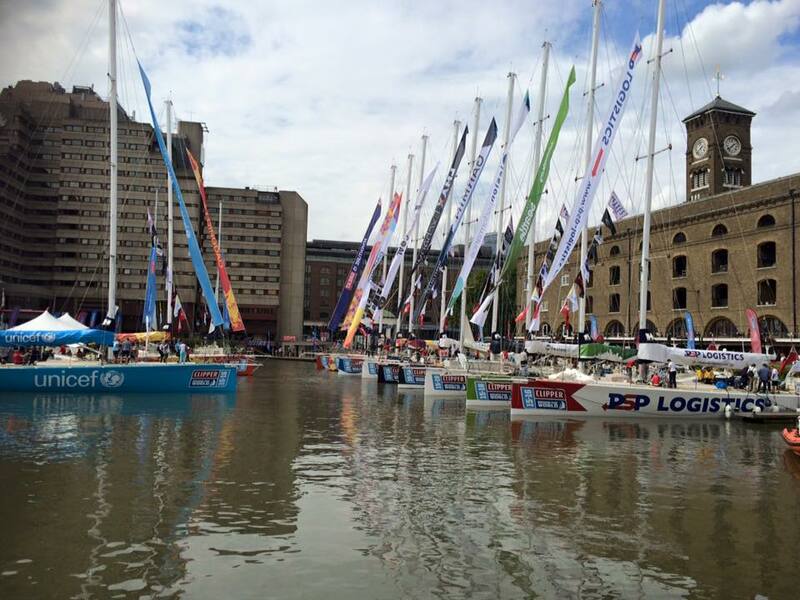 Paul had put a short video on about the Clipper Race, and then he had put together a little “surprise”. A compilation of photos and captions to music that spanned the last thirty five odd years – many of the photos not actually doing me any favours! It was a really warts and all compilation – and that got a few laughs as well! We then had a raffle and auction – Jamie actually donated a Dinner Party for ten for the auction, so generous. At the end of the day, we raised just over £1,750. Perfect! And it was a lovely way to say goodbye to everyone. We all had a superb afternoon, plenty of drinks, laughs and dancing. It still didn’t seem to be sinking in that I was not going to be around here much longer. So, this morning I woke up to still have to do the packing. I had to pop up to Elmswell Shop to get a pillow I had ordered on the internet (long story, but to cut it short I needed a smallish one to fit into the waterproof pillowcase I had bought about two months ago and then promptly forgot to find a pillow) and my currency to last me all stops to Australia. Cutting things fine again then! Stopped there for a coffee – and then really had to get home to start that packing! Apart from the packing, I had an Ocado delivery coming with liquid egg (what trouble I had finding that!) that I had to take to London with me. Good job I had a taxi! My sleeping bag was huge, I had another huge bag with my foul weather gear and boots in, and then I had to get all the clothes that I would need for the next eleven months into dry bags, and then into a suitcase. As well as another suitcase for the clothes I would need for this week. I ziplocked a complete change of underwear into separate bags, and then vacuum packed them into a dry bag – only four lots, one change a week! Thermals went into another one, with the cold weather gear, shorts and trousers into another one, tee shirts into another one. Didn’t think I would ever remember what was in which bag, so I wrote on the outside with a permanent marker. Bet I won’t be able to read that in the dark! Harriet came home and gave me a bookmark that she had bought with some lovely words on – Remember what is most important. It’s not having everything go right; it’s facing whatever goes wrong. It’s not being without fear; it’s having the determination to go in spite of it. It’s not where you stand, but the direction you’re going in. Remember to live just this one day and not add tomorrow’s troubles to today’s load. Remember that every day ends and brings a new tomorrow full of exciting new things. Love what you do, do the best you can, and always remember how much you are loved. That opened the flood gates! It then hit me like an express train that I was just about to leave my family for eleven months – well, if I got the packing done that is! That bookmark, not a huge amount of use with my kindle, will be stuck up next to my bunk to give me inspiration when things are not going quite right. Let’s hope I don’t need to read it until at least I am clear of the Thames! 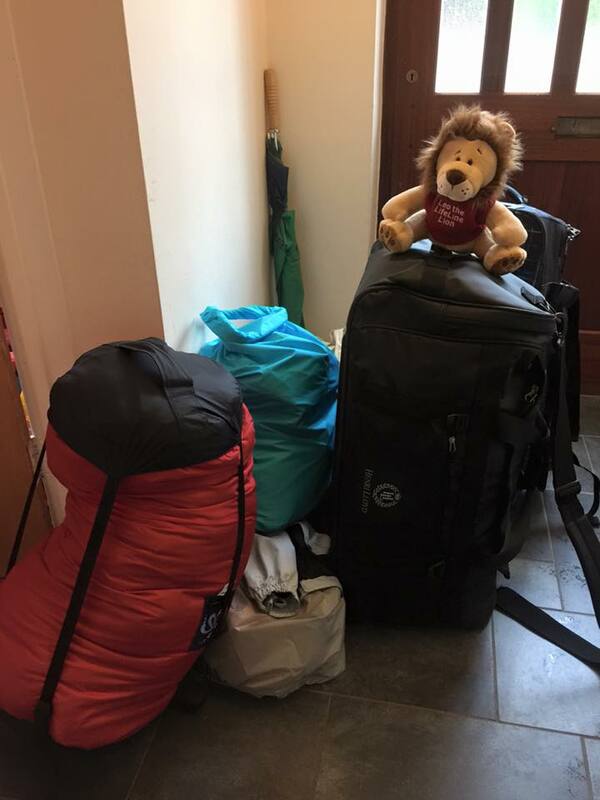 I did get the packing done – and half an hour before the taxi arrived. No problem then. Haven’t actually ever been ready on time before, so that probably means I haven’t got everything that I need. At least I am only going to London, and if I have forgotten anything Paul can bring it up at the weekend! So – with all the training completed I am apparently race ready. On paper that is. Do I feel race ready? Not on your nelly! I seem to have picked up a “job” along the way. At some point in the past – probably at the crew allocation day – I must have raised my hand to volunteer to be a victualler. I had never actually heard of that word before I became one. Somewhat wish I still hadn’t heard of it. As I am particularly useless at most things on the boat, my thinking was that perhaps this is a job I can do to make myself useful. I seem to remember that the question of “who would like to be the victualler” was asked in a very nonchalant way – I certainly did not expect the amount of work that I have been doing in the last few weeks at all. For those that were like me and don’t know what that word means – it is “one that provisions an army, a navy, or a ship with food”. That doesn’t even get close to explaining how much work is actually involved. In my normal fashion, I could have started preparing for this many weeks before I did. Each boat has a victualler, and we were all invited to Gosport for the day to have a training session from one of the victuallers from the last race. After about six hours, I still didn’t really feel as if I had got a clue what I was doing. The other eleven victuallers present didn’t seem to either, so I was not alone! I made the journey back to Suffolk thinking that I had got myself into hot water again. So, did I get right on and devise the menus. No. As usual, everything was left to the last minute. Well, not literally the last minute. When I started working on the menus I thought I had loads of time. But it took days and days and days just to come up with a seven day meal plan that had variety and with ingredients that would last five weeks on the boat before being used. Breakfast was easy – porridge and muesli and cornflakes. It was the other meals that made my brain hurt. But, after spending hours finding tasty meals that were quite different to each other I came up with the list for the week. Then I had to make all the recipes big enough for 20 people. And then I had to try and make sure that the size of package that the ingredients came in sort of fitted the amount we needed in the recipe. That really hurt my brain. And I am not sure if the ingredients are now in the right denominations. I am not going to cook each one for 20 people just to try them! Now that I had done what I thought was the hard bit, I had to deconstruct everything into individual ingredients and then times them by the amount of days that we are planning to be at sea. And then add five – just in case! I was then dreaming of food. My brain could not switch off. 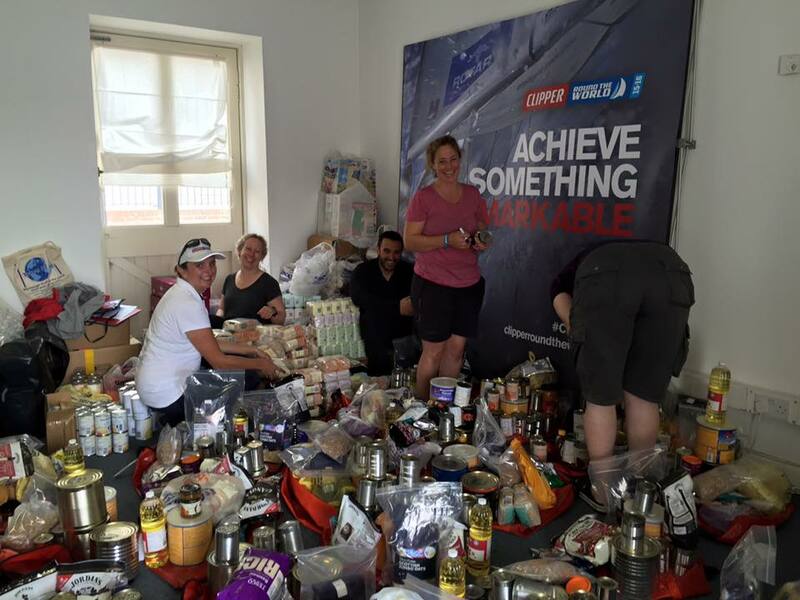 This all had to be loaded onto the boat on 13th August – our allocated day in the training room to have all the food delivered, packed into bags and stored safely ready for the race. In my wisdom, I decided that it would be far better to have the food delivered to my house and pack it in the comfort of my own home. Once I had the spreadsheet worked out, and I knew what I wanted, I then had to do an online order. Clipper had set us up a Makro account, but I decided to have a Tesco tab open just to double check the price of each element. I ended up ordering about two thirds of the goods from Tesco, because they were cheaper. Oh, and by the way, my other constraint was the budget I had – £3.50 per person per day. This was about the only time there have ever been some Tesco Value products in my delivery! To say that I was drowning was an understatement. I have never felt so out of my depth. Would everyone like the meals – have I ordered enough (nowhere to stop off to refill the cupboard between London and Rio), and would the recipes work? I don’t usually have sleepless nights, but I must admit I was awoken several nights haunted by spreadsheets and milk powder. When the deliveries came, there was missing things. With Tesco that wasn’t so bad – Paul did a few nights of click and collect for me. The Makro stuff had to go on another order to be delivered to Gosport on 13th. And with Tesco, we got quite a few substitutions of better goods than I had ordered, and with a price match. Result. My lounge and my sunroom were filled to the brim with food – then it all had to be packed into dry bags, one for each day. I saw 5am and midnight most days for a few weeks – why didn’t I start this all earlier? Will I ever learn? Probably not, based on past experience. William dropped off his van, and loaded the bags in before I got home from work one evening. What a star! His van was full to the brim – not sure where all of this is going to go in the boat. Paul drove the van and we stayed in Southampton overnight, ready to get everything on the boat the following morning. I met a few more of my crew mates, and so did Paul. Then I realised that everything had to be unpacked, as all the tins had to have the paper taken off and labelled as they were going in the bilges. Aarghhh. Everything was taken out and laid out on the floor, and with able help from Kirsty, Emily, Valerie and Deb we made good progress. What stars! They worked like Trojans. But by 8pm we still hadn’t got anywhere near finishing. We decided to go to the pub with the others instead. Oh dear. As I had to go home that night, I had to leave the finishing of the packing and loading into the boat to the rest. What a good team I have – they all got it in (somehow!) by the end of Friday. Not sure how fast the boat will go with all that extra weight though! I seem to have got the thumbs up from all that looked at my menus – although the recipes are not tried and tested yet. A good start though. At least with doing all this work, I haven’t had time to think so much about the race start – which is now only just over two weeks away.